birds : It has been a busy week, so my time in the field has been very limited. I managed to get out for a couple of hours on Sunday afternoon and I decided to search for Bitterns at a couple of reedbeds in the north but there was no sign. 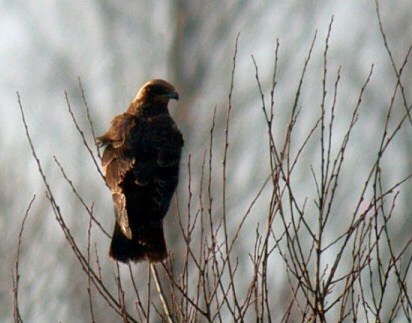 As I arrived at the Grand Pre, I saw a Marsh Harrier perched up in a willow getting a lot of stick from the corvids. It didn't stay there very long and but looking at a few snaps that I took, the bird was ringed and I suspect it may have been one of this year's youngsters from the first ever breeding pair in Guernsey. There wasn't a great deal else visible in the marsh but it was a nice late afternoon walk in the sun. Nearby there was 7 Gadwall in the quarry at Paradis which was a surprise as it doesn't really seem suitable habitat for the species. Moving onto Marais Nord there was a few more birds with up to 20 Shoveler on the lake and 4 species of warbler round the edge, including Firecrest and a singing Cetti's Warbler. Today on the way back from school I finally saw the Black-necked Grebe in the Grandes Havres after many times of trying. nonsense : I have had to fiddle with the format of this website a bit this week so that I could categorise the posts and make them more searchable, rather than just in one giant list. This has meant adding a sidebar to list the "categories" and so now I can add a BUBO Listing badge. (Don't forget the best way to manage your list is through the BUBO Listing website - why not register and put on your 2010 bird list). This has narrowed the main section and some of the formatting has gone way off and some of the photos have gone a bit wibbly. 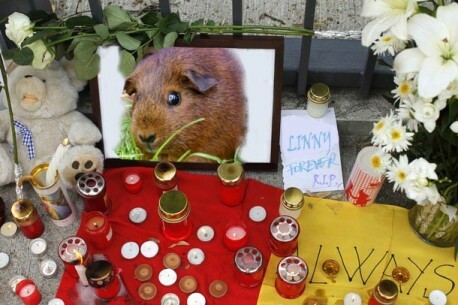 A tragic event at the weekend was the passing of a much-loved member of the local community - Linny the Guinea Pig. She was a fine upstanding cavid, always willing to lend a hand with the lawn-moving and disposal of vegetable peelings. Linny was first named Blinky-Bill (!?) but she changed her name by deed-poll to be like her hero, Linny the Guinea Pig from the "Wonderpets" TV series. She is survived by her sister, Sausage and her two nieces.